The management of stroke is one of those topics that attracts a great deal of controversy in the #FOAMed world, and with good reason. The questions around the use of thrombolysis for acute cerebral infarction, and more recently the use of interventional radiology to deal with thromboembolic strokes are yet to be fully resolved and here at St.Emlyn’s we look forward to more evidence and the resolution of those concerns. It would be fair to say that the focus has been on the management of vaso-occlusive patterns of stroke, but we should not forget haemorrhagic stroke which can be equally, if not more devastating. Intracranial bleeding can occur through a variety of mechanisms, but whatever the cause there is no doubt that an associated coagulopathy will make things worse. In trauma we know that the association of head injury with antiplatelet drugs is a bad thing and so it would seem that patients with a non-traumatic CVA on antiplatelet drugs would be similarly disadvantaged. Unfortunately, many patients with haemorrhagic strokes are on antiplatelet drugs such as aspirin and clopidogrel, drugs with long durations of effect on platelet function. Understandably then there has been much interest in determining whether improving platelet function in these patients improves outcome, with the most obvious therapy being platelet infusion. 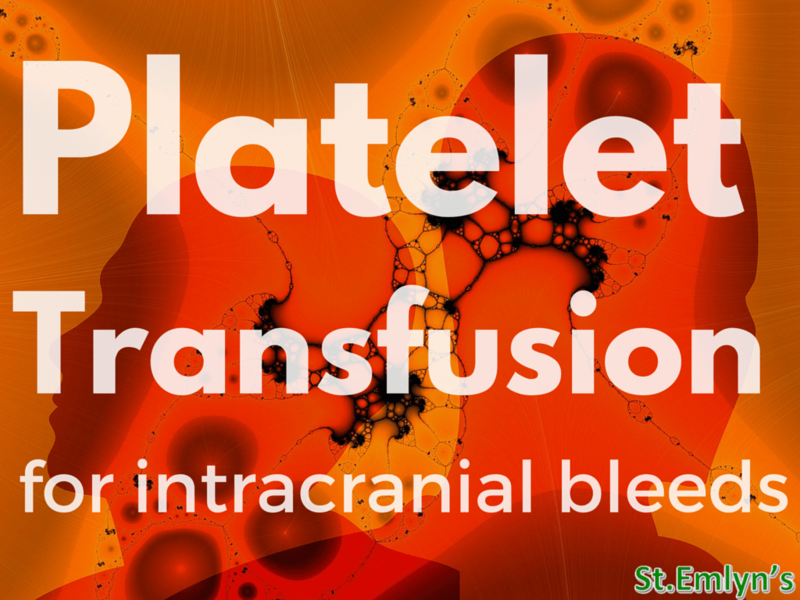 Platelet infusion has been proposed as a way of counteracting the effect of antiplatelet drugs in the acute phase of intracranial bleeding…. but does it work? It’s a question tackled by researchers in the UK, Netherlands and France in the New England Journal of Medicine. The PATCH study was designed to specifically answer the question of whether patients who have a non-traumatic intracranial bleed, who are on antiplatelet drugs, benefit from platelet transfusions. As always, read the full paper after having a peak at the abstract below. This is a randomised controlled trial which is what we would hope for in what is a therapeutic trial. Patients were randomised 1:1 in this trial using a biased coin randomisation technique. Patients aged over 18 with a non-traumatic intracranial bleed were enrolled across 60 hospitals in 3 countries. Participants had to have a proven IC bleed with a GCS >8 and a history of antiplatelet drug use for the past 7 days. 190 patients were recruited. Patients in the standard care group got……., well standard care according to national and regional guidelines. Those in the intervention group got their standard care plus a platelet infusion within 6 hours of onset and within 90 minutes of brain imaging, so pretty soon in the pathological process. Patients on COX inhibitors received 1 pack and other patients received 2 units of platelets, this was based on previous work on dose requirements (in vitro work though). What outcomes did they look for? The main outcome was function as measure on the modified Rankin Score (mRS) score at 3 months. They also looked at secondary outcomes such as mortality (quite an important one) and brain imaging changes. For the principle outcome of an mRS of 3-6 there was a difference in favour of the control group (89% vs 82%). Similarly when they cut the data at mRS of 4-6 there was still a difference (72% vs 56%) which was also statistically significant. This indicates that the patients with a platelet infusion did worse in terms of function. An mRS of 3 is moderate disability; requiring some help, but able to walk without assistance or worse. An mRS of 4 is moderately severe disability; unable to walk without assistance and unable to attend to own bodily needs without assistance. I think the 3-6 grouping is the one that I’m most interested in, and there is a great graphic in the paper that illustrates how the groups differ in terms of mRS scores. It’s a little unclear to me, but it does look as though the original statistical plan was to analyse the data at using mRS 4-6 as the primary endpoint. They did not find statistical significance at that level, rather the analysis at mRS 3-6 did. Is this is an unfair shift in approach? I don’t think so as it’s still using the mRS, albeit at a different, but similarly clinically important cut off. I think it is worth noting but I don’t think it invalidates the findings. The data graphic also shows trends of better outcomes at all levels of mRS as compared to standard care. Similarly mortality was also worse in the platelet infusion group (68% vs 77%). That’s an NNH of just under 10 and so if true (confidence intervals aside) then that’s a really important difference. The authors then looked adjusting the data for country, haematoma volume and country, but the trends were the same across all groups (though statistically each group was smaller so the significance was smaller). The bottom line is that whichever way the authors looked at the data the indication is that platelet infusion worsens outcome. So should we stop using platelets in these patients? This is the best evidence thus far and on the face of it is a pretty strong evidence base for not using platelet transfusions, but there are some limitations. The pragmatic nature of the trial meant that a number of patients had protocol violations (most commonly getting enrolled in error) and there were some baseline differences between the groups, but these are unlikely to have significantly influenced the results. This is still a relatively small trial with just under 200 patients and so random effects may still have influenced the results. What is really interesting is on determining a causal mechanism for this finding that is clearly at odds with the original research idea. The authors postulate a number of potential mechanisms but none of them can be determined from this type of study. We may never know. Unless new evidence emerges, new trials are published, or alterations in therapy are proposed then if your patient has a non-traumatic intracerebral bleed, and they are on clopidogrel, aspirin or some other antiplatelet drug then don’t prescribe the platelets. Recovery time of platelet function after aspirin withdrawal. Curr Ther Res Clin Exp. 2014 Mar 25;76:26-31. Lee J, Kim JK, Kim JH, Dunuu T, Park SH, Park SJ, Kang JY, Choi RK, Hyon MS.
Recovery of platelet function after discontinuation of prasugrel or clopidogrel maintenance dosing in aspirin-treated patients with stable coronary disease: the recovery trial. Price MJ, Walder JS, Baker BA, Heiselman DE, Jakubowski JA, Logan DK, Winters KJ, Li W, Angiolillo DJ. J Am Coll Cardiol. 2012 Jun 19;59(25):2338-43. doi: 10.1016/j.jacc.2012.02.042. Love the summary. Can we take the 4 pts on ADP agents who were transfused compared with the 1 who was on an ADP agent who wasn’t given platelets and draw a meaningful conclusion? This study for me may conclude that pts on ASA with head bleeds may not benefit from platelets. They had 71 and 78 pts in those groups. Are these small numbers large enough to translate into withholding platelets for pts with headbleeds on ADP agents? The study quality is rather poor in my opinion. Protocol violations aside, including patients with exclusion criteria invalidates all conclusions. Analysis done excluding those patients simply result in an inadequately powered study. 60 centers (but only 41 managed to recruit), no standardized care, open label, missing data, etc…. its a valiant effort but really doesn’t add much to our knowledge (except to confirm the difficulty with multi-centre/multi-national trials).